What is the responsibility of the craft artist of the 21st century? 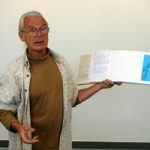 On June 15, 2007, book artists, poet, and deep ecologist Paulus Berensohn spoke in Steve Miller’s letterpress printing class at Penland School of Crafts. Music by Guardian Mind Mix.